When we woke up the morning after our Stone Valley hike, the sky looked ominous. 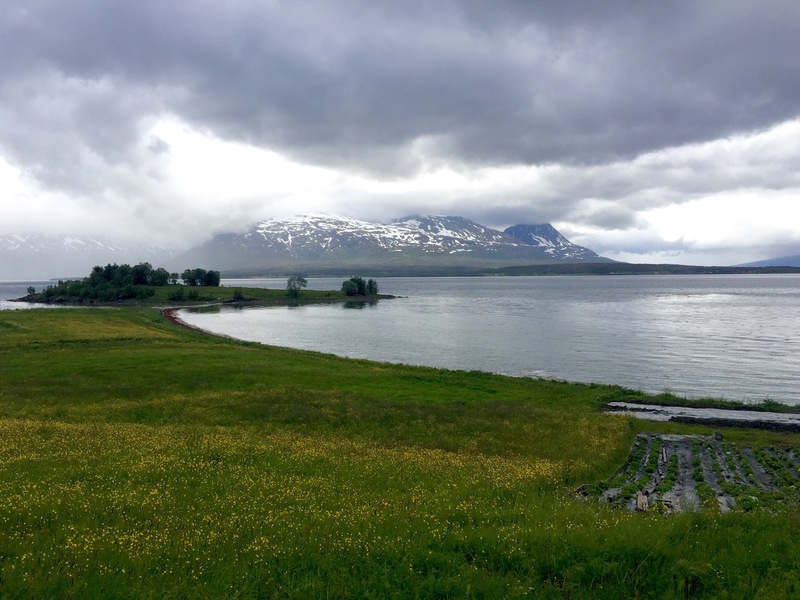 At the lodge, they make a point of telling you that Abisko is in the rain shadow of the mountains of Norway and they get very little rain as a result. Could be, but that wasn’t our experience. Sensing that it was going to be a rainy day (and feeling a little tired from our trek the day before), we decided to make it a driving day to see how far North we could go. The Norwegian tourist brochures tell you that the country’s northernmost “city” is Tromsø, which is true if you consider anything under 50,000 people to not be a city. The brochures also say that Tromsø is the “Paris of the North.” Don’t believe it. 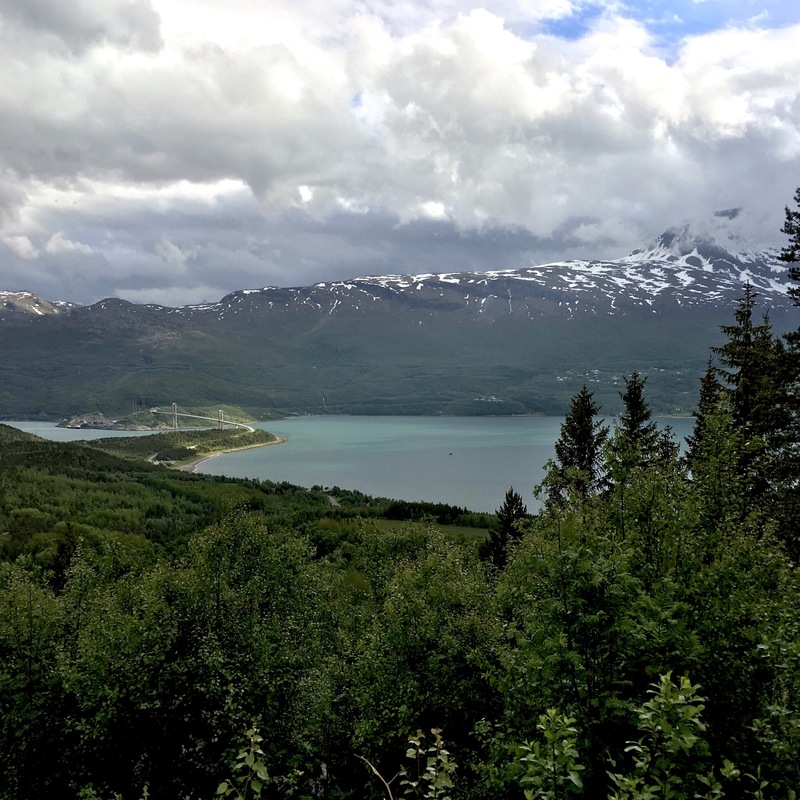 Don’t get me wrong: Tromsø is an impressive place and it is quite a city (population about 75,000), but I’ve been to the real Paris – and to the “Paris of the South,” Buenos Aires – and there’s no comparison. 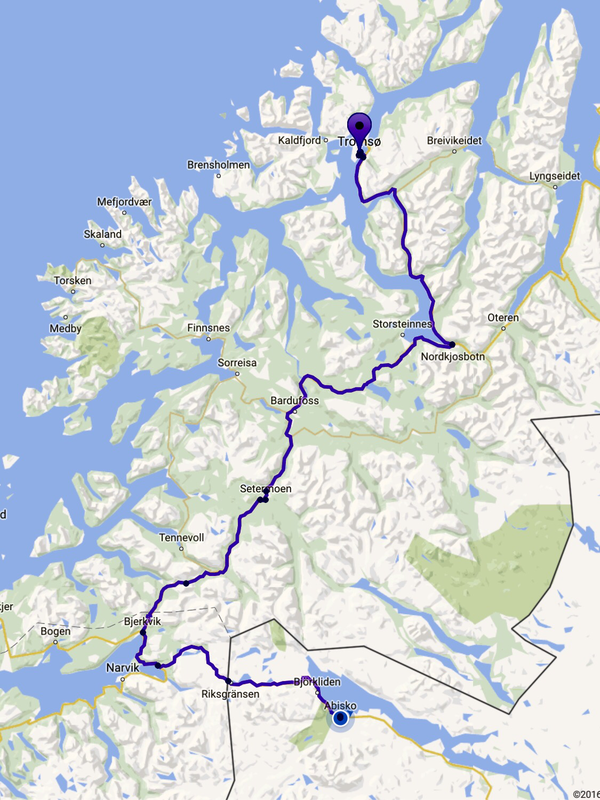 At any rate, we pretty much drove straight up there from Abisko. It was a 185 mile drive and took about 4 hours. We stayed on the main roads, E10, E6 and E8, which were well-built, 2-lane roads – and relatively new. 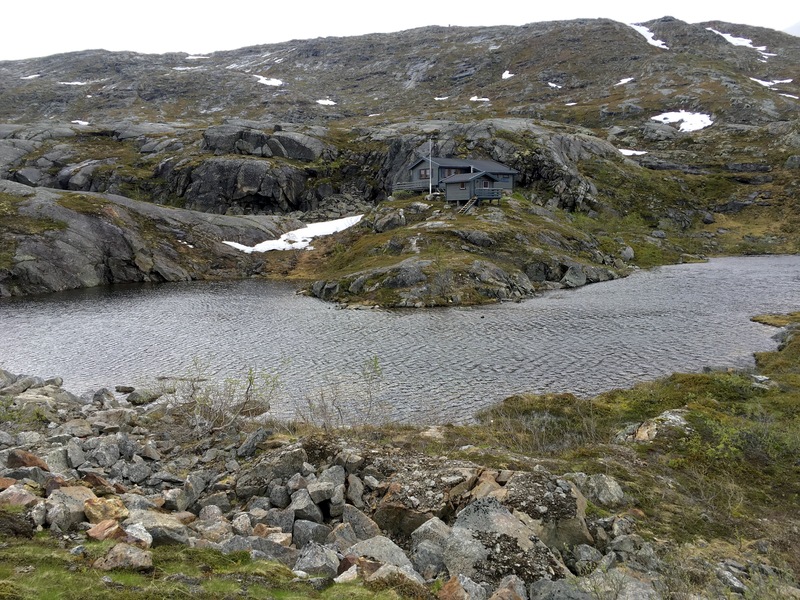 The E-10, which connects Abisko, Sweden, to Narvik, Norway, didn’t even exist until 1984! Prior to that there was only the train, so, as you might imagine, there’s very little development of any kind outside of the towns in this part of the world. Most of the city is on an island. So, after crossing the bridge, we drove up the hill so I could take this photo, looking back east at the bridge and the big church on the other side of the sound. 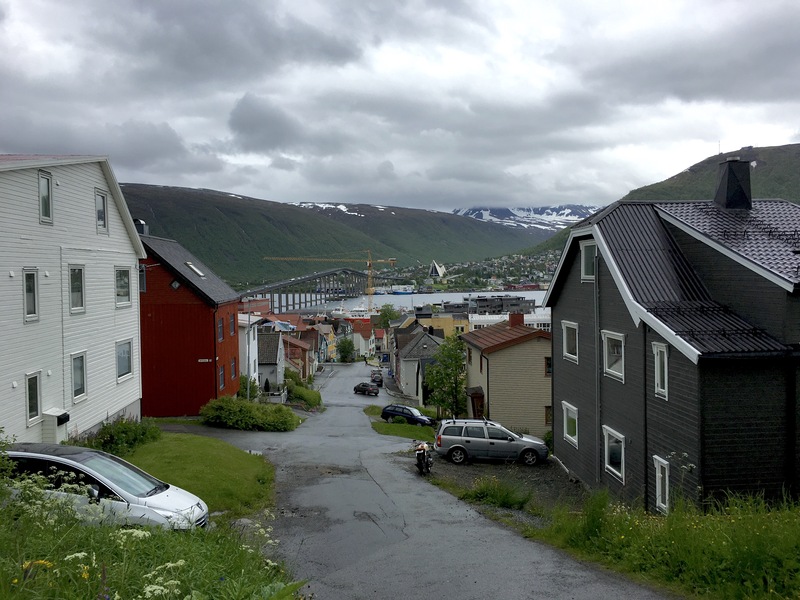 The buildings you see are pretty typical of the residential structures in Tromsø; they appear to be mostly multi-family, which seems to be the norm in urban Scandinavia. We didn’t stay long in Tromsø. 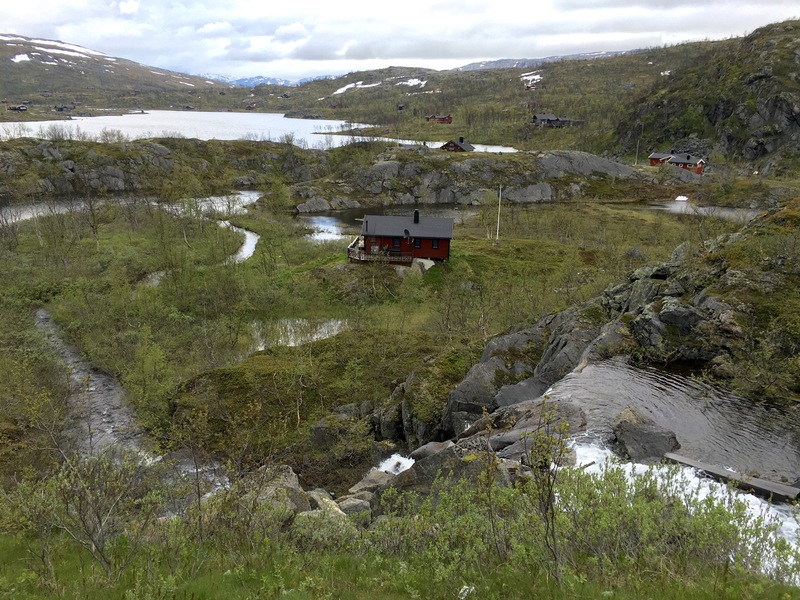 We were really more interested in seeing the fjords and scenery, rather than the city and towns. 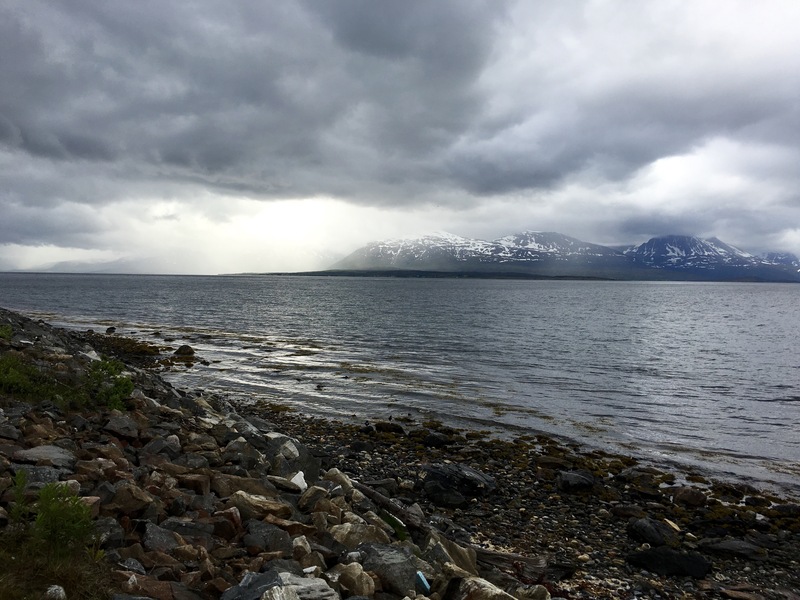 In fact, our main purpose in making Tromsø our terminal destination was that we were hoping to catch a ferry from there going south in order to experience the fjords from the water. 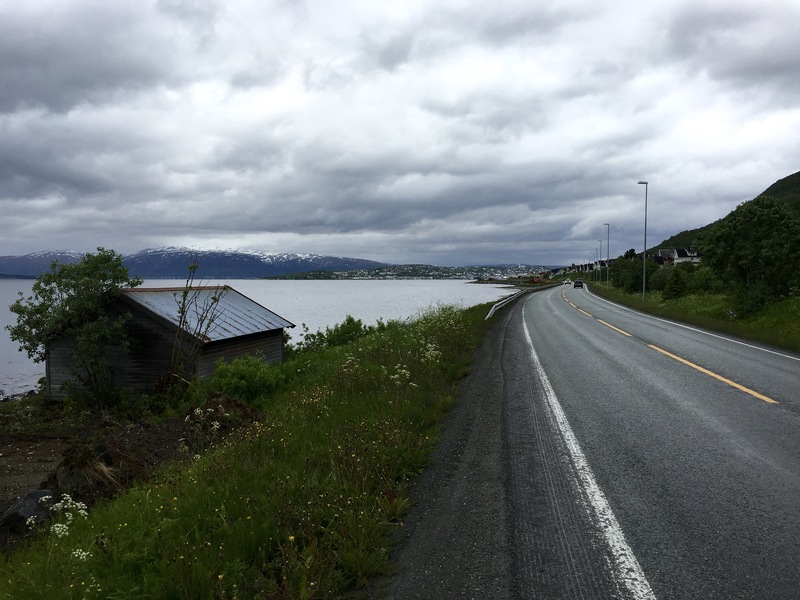 Unfortunately, none were in port when we arrived, so we drove around town for an hour and then headed back toward Abisko. On the way south, we ventured onto a local road that ran along the shoreline and afforded several magnificent views. Almost immediately after the start of WWII, right after Hitler attacked Poland, Germany invaded and occupied Norway, landing troops on April 9, 1940, in Oslo, Bergen, Trondheim and Narvik. One of the main reasons for this action was to secure the supply of iron ore that Germany needed for its war machine. Most of this ore was mined at Kiruna, Sweden, the city that we flew into just a few days ago to start our Northern Adventure. You might recall that I mentioned in my last post that there is a railroad, the Malmbanan, connecting Kiruna to Narvik. The Malmbanan was built over 100 years ago in order to get the ore from Kiruna to the deep-water port in Narvik which is open year-round. Some of the iron ore in northern Sweden is transported to the east to Luleá at the north end of the Gulf of Bothnia, but the Gulf ices up for about half the year, limiting the amount of ore that can transit through that port. Symbiotically, German demand for iron ore rejuvenated Sweden’s economy which, undoubtedly, is one of the main reasons that Sweden declared neutrality during the War. The alternatives were: to ally itself outright with Germany and be invaded by the Allies; or oppose Germany and have Germany invade and occupy Sweden, which could have been the end for both countries since the Swedes would have been forced to sabotage their mines and rails if that had happened. At any rate, back to the Battle of Narvik. The 2,000 specialized German troops that were put ashore quickly captured Narvik, overwhelming the Norwegian Army garrison there with little, if any, fighting. But the ten German destroyers that had transported the troops to Narvik found themselves stranded after off-loading their soldiers because only one of the tankers that were to follow them into the Ofotfjorden for refueling made it. The British Navy followed and closed the escape route and ultimately, after two naval battles, succeeded in destroying all the German ships, with little loss to the Brits. Within a few weeks, the Allies – British, French, Polish and Norwegian – had amassed 25,000 troops in the area. Astoundingly, however, due to a lack of coordination and to the fact that the Allied troops were not trained for cold or mountain combat (some of the French Legionnaires came straight from North Africa), the Allies were unable to defeat the German troops, even though they out-numbered them 10:1! Elsewhere in Norway, things had stalled and then in May the Germans invaded France and the Low Countries, resulting in the Allies withdrawing their troops from Norway to take them to defend France, abandoning Norway in the process. The Norwegian King and government fled on June 7, 1940, and the country was effectively surrendered to the Germans for the balance of the War. 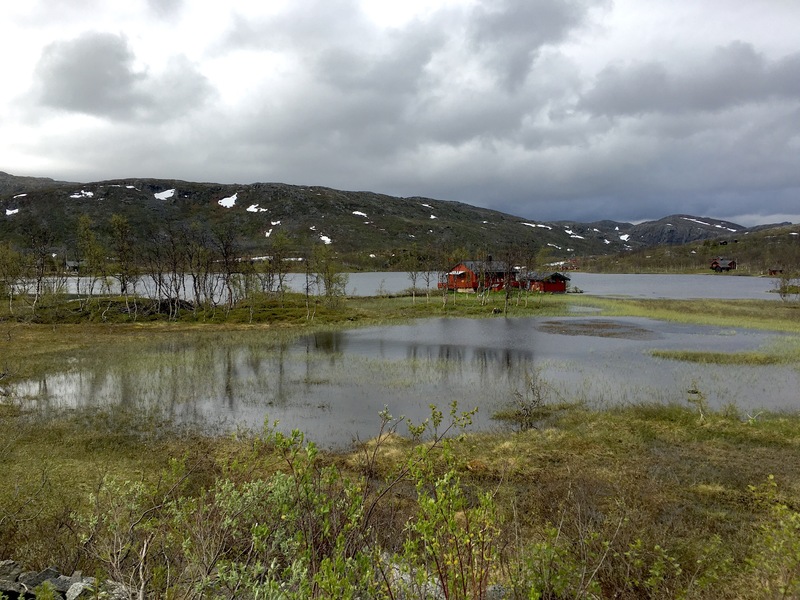 As we approached the Swedish border, we started seeing these picturesque summer camps scattered among the rocks and lakes. There had been some fighting here. 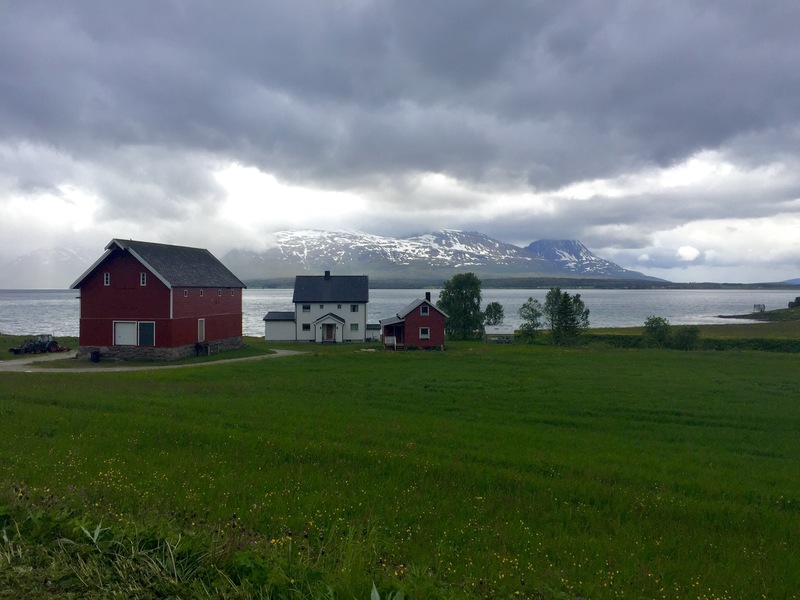 When we arrived back in Abisko, I asked the checkout girl at the gas station convenience store if the cottages we had just seen were owned by Swedes or Norwegians. She said they were mostly Norwegian. She knew because they come to her convenience store to shop, primarily for those “sin” products that Norway taxes so heavily. In the U.S. that would be alcohol and tobacco; in Canada (as we’ve discovered since we built our house in Washington) it’s gasoline and dairy products. In Norway, it’s sugar. 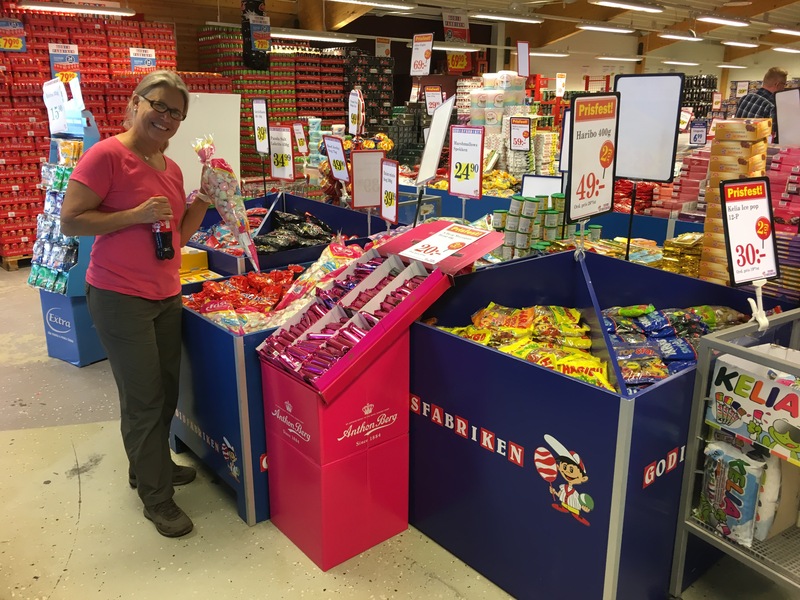 So now its the Norwegians invading Sweden – gotta get that candy and soda!